Since ancient times, maritime trade has been a backbone of Greece’s economy with shipping playing the dominant role. Today, it is the second largest contributor to the national economy after tourism. It is the country’s geography with a coastline almost that of the U.S. (including Alaska) in length together with the mountainous nature of the landmass with 85% of Greek population living within 30 miles of the sea, that has been responsible in creating a strong influence on this industry. Although the country’s shipping experienced regression during the late Roman period, it grew in prominence during the last few centuries of Ottoman rule, when Greek traders dominated the grain trade between southeastern Europe and the West. The emergence of powerful ship-owning families located on the Aegean islands proved an important source of financial strength for the early Modern Greek state, which in turn provided strong support to the shipping industry. Though Greece is a small nation of 11 million, it has more than 86 ports that play a major part in helping the trade of the country; 19 of these are considered busiest maritime ports for passenger transport; 21 for cargo traffic. Even more remarkable is that with its small population it maintains the largest merchant fleet of ships in the world, which as of December 2014 comprised of 4,894 vessels with 291,735,318 deadweight tonnage (dwt) and 168,922,455 gross tonnage (gt), leaving Japan second, and China third. Specifically, while Greek ship owners have fewer ships than either the Chinese or Japanese ship-owners, the Greek-owned fleet is the largest in the world in gross tonnage. Most of the ship owners are well-known names in the world of shipping. 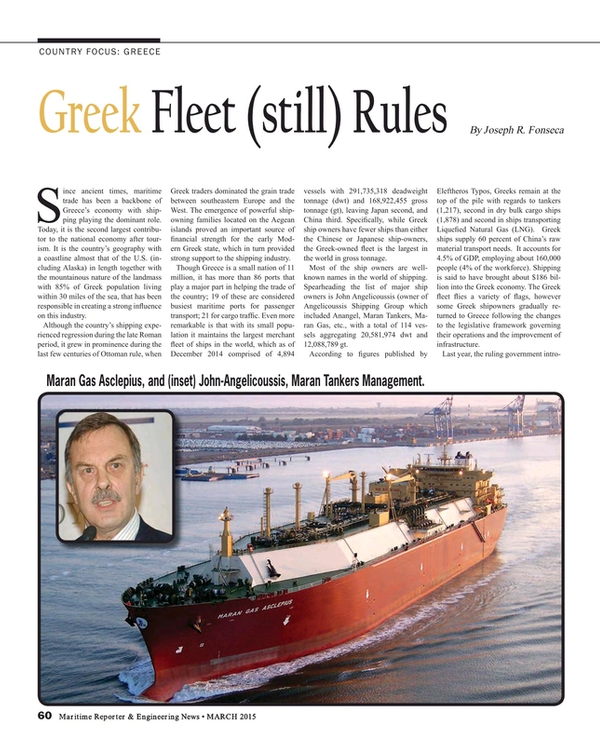 Spearheading the list of major ship owners is John Angelicoussis (owner of Angelicoussis Shipping Group which included Anangel, Maran Tankers, Maran Gas, etc., with a total of 114 vessels aggregating 20,581,974 dwt and 12,088,789 gt. According to figures published by Eleftheros Typos, Greeks remain at the top of the pile with regards to tankers (1,217), second in dry bulk cargo ships (1,878) and second in ships transporting Liquefied Natural Gas (LNG). Greek ships supply 60 percent of China’s raw material transport needs. It accounts for 4.5% of GDP, employing about 160,000 people (4% of the workforce). Shipping is said to have brought about $186 billion into the Greek economy. The Greek fleet flies a variety of flags, however some Greek shipowners gradually returned to Greece following the changes to the legislative framework governing their operations and the improvement of infrastructure. Last year, the ruling government introduced a number of changes to Greece’s tax laws, including some specific to the shipping industry, such as repealing the law imposing mandatory triple tonnage tax on Greek-flag ships and foreign-flag vessels managed out of Greece, replacing it with the voluntary contribution of double tonnage tax payments for the next four years. Another measure with a potential impact on the shipping community included the introduction, for the first time in Greece, of Controlled Foreign Companies Rules covering the concept of effective management and criteria for determining it. The core of the shipping cluster consists of more than 800 ship operators, tightly clustered around the port of Piraeus in Athens, Greece’s largest port. The key contributing factors to the cluster’s competitiveness are the high degree of firm rivalry fostered by the large number of small companies, a highly favorable tax regime, strong informal networks and institutions for collaboration, as well as the presence of specialized maritime educational institutions. However, the cluster’s greatest weaknesses are the absence of local demand for its services, in contrast to competitors such as China and Japan, as well as weak linkages with related and supporting industries. The Greek economy suffers from serious competitiveness problems. In fact, Greece stands out as the least competitive economy in the EU. Greece has high labor costs for its level of productivity. Worse still is that its labor productivity, 12% lower than other Western European countries. As a result the shipbuilding industry is in shambles, with ship owners preferring to place orders with shipyards in China, Korea and Turkey, where labor costs are much lower and minimally regulated. The Hellenic Shipyards and the Eleusis Shipyards were well-known names employing 3,150 and 2,350 workers respectively in 1995. The Hellenic Shipyards at Piraeus on the Gulf of Saronikos was the largest shipbuilding, ship-repairing, and rolling-stock operation in the eastern Mediterranean and one of the largest in Europe. Greece’s second major shipbuilding firm, the Eleusis Shipyards (also located on the Gulf of Saronikos near Athens), had a wide range of activities, including shipbuilding, ship repairs and conversions, and industrial construction. Today the country’s ship building industry is in a sorry state, on perpetual decline. The area around shipyards including that of Perama and nearby Eleusis and Skaramagas, resemble ghost towns. All of which means that as Greek shipping companies rebound, and buy more vessels than anyone else, the yields are not benefitting Greece’s job market or, in particular, its shipbuilding economy.